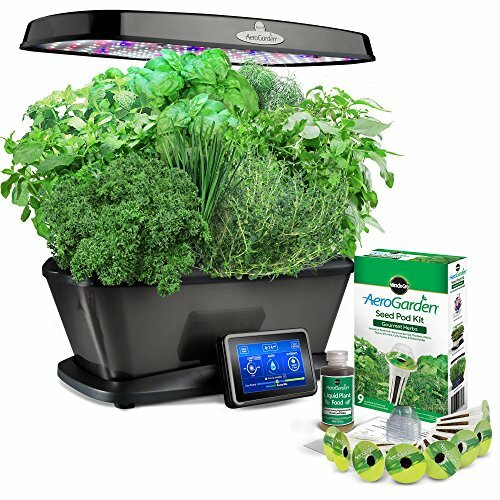 Grow your own full-sized vegetables, herbs, flowers, salad mixes and more, year round and in the comfort of your home, with these fully automated AeroGarden Indoor Gardens made by Aerogrow International. You don’t even need a green thumb to successfully grow thriving plants that produce. Yes, there’s nothing quite like working outdoors in the garden–getting your hands into the warm dirt, wandering among the beds and rows, watching your vegetables grow in the rain and sun as the birds sing. And weeding … many people find it very relaxing. You certainly don’t have to give any of that up by using AeroGardens. They simply give you lovely dirt and weed free options for growing fresh produce and flowers any time of year and filling your home with green. They are great for starting seedlings inside for later transplanting into your outdoor gardens when the plants are ready and the weather warms. AeroGardens are fool proof, soil free, indoor gardens. They are so easy to use that anyone can grow lush, beautiful gardens anytime of the year. 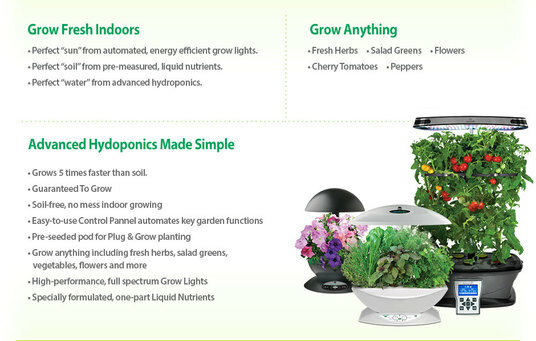 With Aerogarden you can grow almost anything, anywhere year round. You don't need soil, there are no weeds, and no gardening experience is needed. Here, referenced below, are many of the different AeroGrow AeroGarden models made, kits and accessories to go with them and where to buy them online. They have a seed kit for almost every veggie and herb and some fruits like strawberries. If you choose to purchase an Aerogarden, you can begin with just one to give it a try or grow a whole indoor garden. They carry starter kits up to the Aerogarden Ultra LED. You can start with the starter kit and work up to many grow lights. You should be successfully growing indoors many different herbs. vegetables, and plants with these systems. ​Imagine fresh herbs and vegetables grown in your home, year-round. 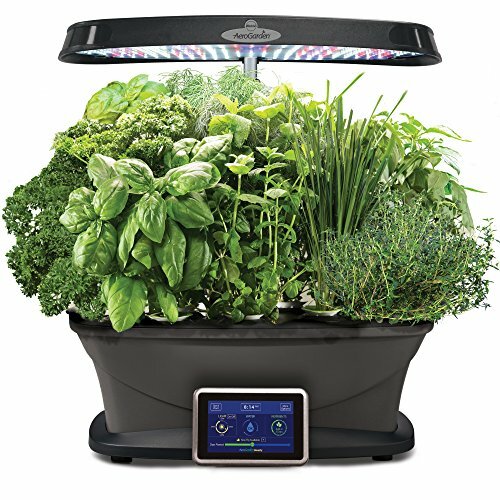 With the Miracle-Gro AeroGarden Bounty you can grow fresh herbs, vegetables, salad greens, flowers and more! This smart countertop garden uses water and patented nutrients to naturally grow plants… no herbicides, no pesticides, non-GMO. It’s natural goodness right at your fingertips. Imagine fresh herbs and vegetables grown in your home, year-round. 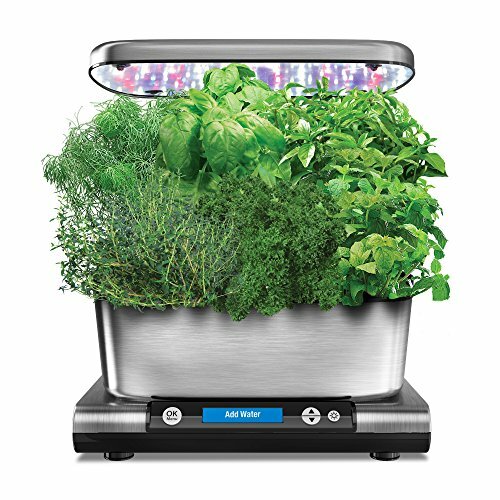 With the Miracle-Gro AeroGarden Harvest Elite you can grow fresh herbs, vegetables, salad greens, flowers and more! This smart countertop garden uses water and patented nutrients to naturally grow plants… no herbicides, no pesticides, non-GMO. It’s natural goodness right at your fingertips. And with a beautiful, stainless steel finish, it will look great on your countertop. Everything You Need is IncludedThis kit includes everything you need to have a thriving indoor garden. 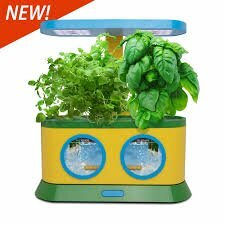 We've included the AeroGarden Herbie, 1 Pizza Party Activity Booklet, 1 Marker, Basil & Oregano Seeds, 1 Measuring Cup, 1 Dropper, 2 Domes, & 1 Plant Food (3 fl oz). All you need to do is add water, plug it in, and press the power button so the bubbler and LED light turns on. The included activity booklet takes you through all the steps. AeroGardens are the world’s leading indoor gardening systems. The AeroGarden Bounty Elite Wi-Fi grows more, faster than any AeroGarden to date. You can grow up to 9 plants in this garden and they’ll love the 45-watts of high performance, energy efficient LED lighting. The LED lights are tuned to the specific spectrum that allows plants to maximize photosynthesis, resulting in rapid, natural growth and abundant harvests. The LED lights concentrate daylight white LEDs for fast growth, blue LEDs for bigger yields, and red LEDs for more flowers and fruit. With ideal lighting and optimally balanced levels of water and nutrients, plants grow up to 5 times faster than when grown in soil. This new and improved Seed Starting System will allow you to start up to 36 seedlings indoors in your AeroGarden 6 or AeroGarden 6LED with no dirt and no mess, then easily transplant them into your outdoor garden when weather allows. The new and improved design provides more room for each plant which promotes healthier root development and makes removing and transplanting seedlings easier than ever. The AeroGarden nurtures your seeds with optimal amounts of water and plant food, and provides plenty of light and warmth for reliable germination and healthy growth.